The predicted N-terminus is Thr27. Our Abpromise guarantee covers the use of ab167715 in the following tested applications. It is recommended to reconstitute the lyophilized protein in 10µl sterile deionized water to a final concentration of 1mg/ml. Solubilize for 30 to 60 minutes at room temperature with occasional gentle mixing. Carrier protein (0.1% HSA or BSA) is strongly recommended for further dilution and long term storage. SDS-PAGE of reduced ab167715 stained overnight with Coomassie Blue. Publishing research using ab167715? Please let us know so that we can cite the reference in this datasheet. Wells A1 and A2 were coated with 100µl/well of 1µg/mL of gp120 diluted with a carbonate coating buffer (pH 9.80). 100µl/well of empty coating buffer was added to wells B1, B2, C1 and C2. The plate was covered with Parafilm and incubated overnight at 4℃. All wells were washed with 180µl/well of PBST 0.05% a total of 5 times allowing ≈30 seconds of soak time, and then slapped dry. All wells were blocked with 200µl/well of 1X Assay Diluent for 2hr at RT at 40RPM. Washing procedure was repeated. 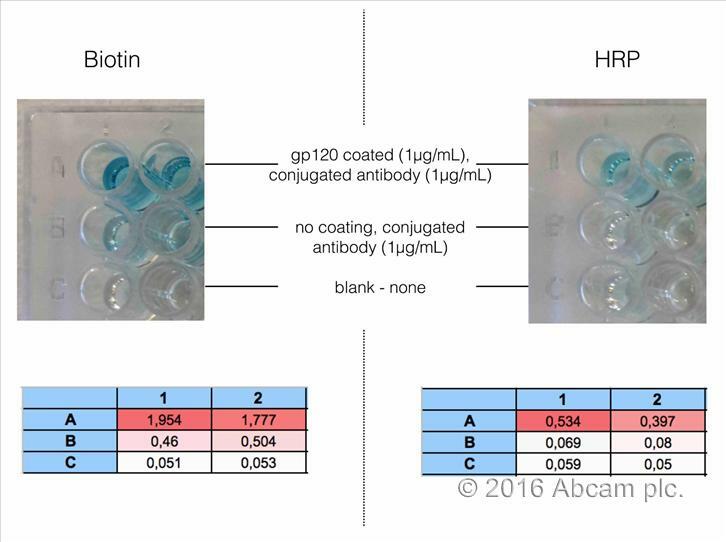 The HRP conjugated antibody (ab106578) (self-conjugated according to protocol for Lightning Link HRP Conjugation Kit) was added at 100µl/well at 1µg/mL and incubated for 2hrs at RT at 40RPM. Washing procedure was repeated with a total of 7 wash cycles. 100µl/well of TMB was added, and after 15 min 50µl/well of stop solution (2N H2SO4) was added. The plate was read at 450nm (Biotek instrument). Wells A1 and A2 were coated with 100µl/well of 1µg/mL of gp120 diluted with a carbonate coating buffer (pH 9.80). 100µl/well of empty coating buffer was added to wells B1, B2, C1 and C2. The plate was covered with Parafilm and incubated overnight at 4℃. All wells were washed with 180µl/well of PBST 0.05% a total of 5 times allowing ≈30 seconds of soak time, and then slapped dry. All wells were blocked with 200µl/well of 1X Assay Diluent for 2hr at RT at 40RPM. Washing procedure was repeated. The Biotin conjugated antibody (ab106578) (self-conjugated according to protocol for Lightning Link Rapid Biotin Conjugation Kit) was added at 100µl/well at 1µg/mL (diluted with 1X Assay Diluent) and incubated for 2hrs at RT at 40RPM. Washing procedure was repeated. 100µl/well of Avidin-HRP was added at a dilution factor of 1:250 (diluted with 1X Assay Diluent). Washing procedure was repeated with a total of 7 wash cycles. 100µl/well of TMB was added, and after 15 min 50µl/well of stop solution (2N H2SO4) was added. The plate was read at 450nm (Biotek instrument). 100µl of Type 1 ultrapure water (Milli-Q) and 100µl of 0.2% BSA were added to the recombinant protein. The vial was gently shaken to ensure no foam forms. It was then incubated at RT for 1hr with gentle shaking every 15 minutes. The reconstituted protein was then aliquoted and stored at -20℃ in protein low bind tubes.